The 20th century was the century of the image (...). To tell Henri Cartier-Bresson’s story and to unravel his work is essentially to tell the story of a look. Throughout the 20th century, this roaming, lucid eye has captured the fascination of Africa in the 1920’s, crossed the tragic fortunes of Spanish republicans, accompanied the liberation of Paris, caught a weary Gandhi just hours before his assassination, and witnessed the victory of the communists in China. Henri Cartier-Bresson was also Jean Renoir’s assistant on three major films, an artist who sees himself an artisan but who nevertheless established Magnum, the most prestigious of all photo agencies, and who immortalised his major contemporaries : Mauriac in a state of mystical levitation, Giacometti, Sartre, Faulkner or Camus, and as many more all taken at the decisive moment, all portraits for eternity. 1908: Born on August 22nd in Chanteloup, Seine-et-Marne. Educated at the Lycée Condorcet, Paris. 1926: Studies painting under André Lhote. Takes his first photographs. 1930: Spends almost one year in the Ivory Coast. 1931: Discovers a photograph by Martin Munkácsi in the arts magazine Arts et Métiers Graphiques and decides to focus on photography. 1932: Buys his first Leica and travels accross Europe with his friends Leonor Fini and Pieyre de Mandiargues. First publications in Voilà and Photographies. 1933: First exhibition at the Julien Levy Gallery, New York. His photographs are subsequently shown at the Ateneo Club in Madrid. 1934: Goes to Mexico with an ethnographic expedition team. The mission fails, but he decides to stay. 1935: Exhibits with Manuel Alvarez Bravo at the Palacio de Bellas Artes, Mexico and one month later at the Julien Levy Gallery with Walker Evans and Manuel Alvarez-Bravo. Spends some time in the USA, where he discovers filmmaking with Paul Strand and Nykino Group. 1936: Works as second assistant to Jean Renoir on Une partie de campagne (A Day in the Country) and La vie est à nous. 1937: Directs two documentaries: Victoire de la vie (Return to Life) on the medical care of Republican Spain and With the Abraham Lincoln Brigade, on the American soldiers’ life during the Second World War. Photographic report on the coronation of George VI published in the newspaper Ce Soir. 1938: Directs, upon request by the Spanish Secours Populaire, a documentary about the Spanish Civil War, L’Espagne vivra. 1939: Joins Jacques Becker and André Zvoboda as an assistant on Jean Renoir’s La Règle du jeu (The Rules of the Game). 1940: Joins the “Film and Photography” unit of the Third Army. Taken prisoner by the Germans on June 23rd. 1943: After two failed attempts, successfully escapes on his third attempt in February 1943. Works for MNPGD, a secret organization created to help prisoners and escapees. 1944: Takes a series of photographic portraits of writers and artists for Editions Braun (Henri Matisse, Pablo Picasso, Georges Braque, Pierre Bonnard, Paul Claudel, Georges Rouault). 1945: Directs Le Retour (The Return), a documentary on the repatriation of prisoners of war and detainees. 1946-47: Spends over a year in the USA. Upon Harper’s Bazaar request, he travels for a few months with John Malcolm Brinnin to photograph artists and writers. 1947: Exhibition Photographs by Henri Cartier-Bresson at the Museum of Modern Art in New York. Creates the cooperative agency Magnum Photos with Robert Capa, David Seymour (Chim), William Vandivert, and George Rodger. 1948–50: Spends three years in the Far East: in India for the death of Gandhi, in China for the last six months of the Kuomintang and the first six months of the People’s Republic, and in Indonesia for its independence. His photographs are published all over the world. 1952: His first book, Images à la Sauvette, with its cover by Matisse, is published by Tériade. First exhibition in England, Photographs by Henri Cartier-Bresson at the Institute of Contemporary Arts. 1953: Travels throughout Europe for Holiday. 1954: Publication by Robert Delpire of his books Les Danses à Bali and D’une Chine à l’autre, marking the beginning of a long collaboration with Delpire. He is the first photographer allowed in the USSR since the beginning of the Cold War. 1955: First exhibition in France at the Pavillon de Marsan in the Louvre. Tériade publishes Les Européens (cover illustrated by Miró). 1958: Returns to China for three months for the tenth anniversary of the People’s Republic of China. 1961: Creates a set of portraits for the magazine Queen. 1963: Returns to Mexico for the second time. Life magazine sends him to Cuba. 1965: Spends several months travelling in Japan. 1967: Commissioned by IBM to create Man and Machine. This project becomes an exhibition and a book. 1968-69: Spends a year travelling around France for Reader’s Digest and publishes a book, Vive la France, to accompany the exhibition “En France” at the Grand Palais in 1970. 1970-71 : Directs two documentaries in the USA for CBS News: Southern Exposures and Impressions de Californie. 1972-73 : Returns to the USSR. 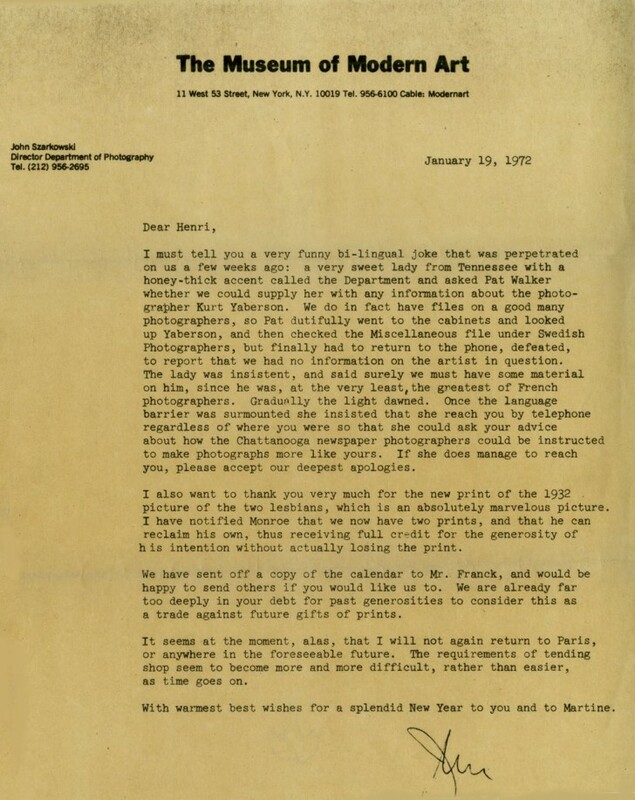 1974: Terminates his active working relationship with Magnum Photos, although the agency distribution retains his archives. Concentrates on drawing. 1975: First exhibition of drawings at the Carlton Gallery, New York. 1987: Photographic exhibition The Early Work at The Museum of Modern Art, New York. 1988: The Centre National de la Photographie celebrates his 80th anniversary. Creation of the HCB Award. 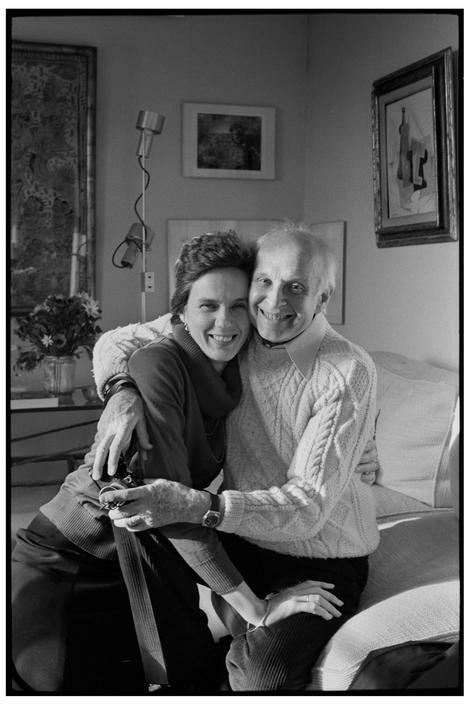 2000: Makes plans to set up the Henri Cartier-Bresson Foundation with his wife, Martine Franck, and daughter, Mélanie. The idea is to provide a permanent home for his collected works as well as an exhibition space open to other artists. 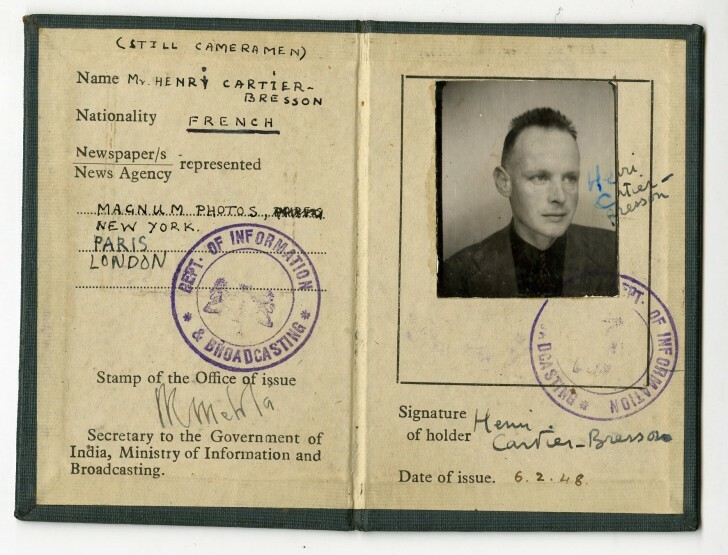 2002: The Henri Cartier-Bresson Foundation is recognized as being of public interest by the French State. 2003: Opening of the Henri Cartier-Bresson Foundation in Paris. Retrospective exhibition De qui s’agit-il ? at the Bibliothèque Nationale de France. 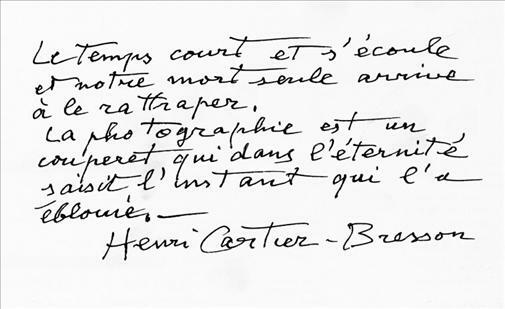 2004: Henri Cartier-Bresson dies peacefully in Montjustin, Provence on August 3rd.